Alex Kozak, Alpa S. Patel, M.D., Brad H. Feldman, M.D., Sadiqa K Stelzner, MD, FACS, Jplymd and Richard G. Shugarman M.D. Assigned status Up to Date by Alpa S. Patel, M.D. on August 31, 2017. Limbal Relaxing Incisions (a subset of astigmatic keratotomy) are partial thickness incisions made at the corneal periphery for the treatment of corneal astigmatism. Abnormal curvature of the cornea with at least two axes of steeper and flatter curvature, which can result in abnormal focussing of light and impaired vision. Astigmatism typically results from curvature abnormalities of the front (anterior) surface of the cornea. Visit EyeSmart from the American Academy of Ophthalmology for a brief, patient-friendly description of astigmatism. Astigmatism may also be classified as regular and irregular. Wherenever the two main axes of astigmatism are not symmetric and do not lie 90 degrees apart (orthogonal), the astigmatism is considered irregular. The patient may present with a long history of astigmatism. Close examination of the peripheral cornea, particularly in the areas where the incsions will be placed. The most common symptom is decreased visual acuity. The patient might notice that straight lines are not straight. Patients with even small amounts of cylinder may notice halos, glare and shadowing, especially in low light conditions and at distance. Astigmatism is also measured during refraction. However, this measurement may include corneal and lenticular astigmatism. Therefore, this measurement cannot be used solely for determination of AK procedures. The next step is to determine how much of the measured astigmatism is a result of corneal irregularity. Goal of astigmastism control is to leave the patient with as little astigmatism as possible. Some patients can tolerate up to 1.0 diopter in any axis and still maintain 20/40 vision at distance and J1 at near. Typically, with-the-rule and against-the-rule astigmatism are better tolerated than oblique astigmatism. The most crucial element of surgical planning for astigmatic keratotomy is determining the amount and location of the astigmatism to be corrected. This is also perhaps the most difficult aspect of this procedure. As mentioned above, preoperative astigmatism measurements are done in several ways. It is common for many surgeons to rely on manual keratometry as their measurement; however many use either corneal topography or Scheimpflug imaging. It is important to remember that the manual refraction may include any lenticular-induced cylinder as well, so often times the refraction will be misleading. The manual keratometry axis of astigmatism should match the topographical or Scheimpflug axis. Astigmatic keratomy(AK) can be divided into 2 groups: limbal relaxing incisions (LRIs) and corneal relaxing incisions (CRIs). The surgeon must evaluate the pros and cons of each in conjunction with the needs of each individual patient. Easier to perform, less dependent on pachmetry, less likely to result in overcorrections, quicker post-op stabilization of refraction, postoperative topography is smoother/more homogenousm (coupling). LRIs are best for low to moderate amounts of astigmatism (< 3 diopters). CRIs have been noted to have a higher risk of overcorrection so they are more often performed on patients with higher amounts of astigmatism. Either LRIs or CRIs may be used in conjunction with toric intraocular lenses (IOLs) and strategic cataract incision placement to treat high astigmatism. Astigmatism may also be managed with Toric IOLs alone. The surgeon should consider the age of the patient as the effect of the relaxing incision have been found to increases with age. Astigmatism less than 1.0 diopter can typically be adequately treated with LRIs. Astigmatism ranging from 1.0 diopter to 3.0 diopters can be corrected with a toric IOL or LRIs, although toric IOLs are regarded to give more reliable results. Astigmatism greater than 3.0 diopters may corrected with a combination of toric IOL, LRIs (or CRIs) and/or strategic cataract incision placement. The surgeon may opt to utilize an online calculator (See Additional Resources section below for link) for guidance. Online LRI calculator results are based on the preoperative keratometry measurements and anticpated surgeon induced astigmatism. Astigmatic keratomy may be done either in conjunction with cataract surgery or after. There are many nomograms widely available. Ideally, each surgeon develops their own by monitoring their outcomes. While LRIs may be done after surgery, it is easiest for the beginning surgeon to do them in the OR in conjunction to routine cataract surgery. LRIs are often done at the beginning of the case when the eye is still firm. Prior to draping, with the patient in a sitting position, the cornea is marked. Usually the cornea is marked at 12 and 6 o'clock. There are many strageties for marking the cornea. Most LRI corneal marking sets have an instrument designed for making preoperative orientation marks. A diamond knife is most commonly utilized for the LRI incision. Disposable and reusable, metal LRI knives are also available. Both often have preset depths for surgeon convenience. The usual depth is 600 microns but may range from 450 to 650 microns. It is helpful to have handy a print out of the patient's topography and/or LRI calculator print out to ensure appropriate orientation of the LRI. An arc-shaped incision is made in the clear cornea close to the limbus (approximately 0.5 mm). The episclera is grasped with 0.12 forceps. The arc incision is drawn towards the surgeon for best control. It is important to press the LRI blade firmly against the cornea to ensure consistent depth of the incision. Depending the amount of astigmatism to be corrected, paired incsions may be employed. 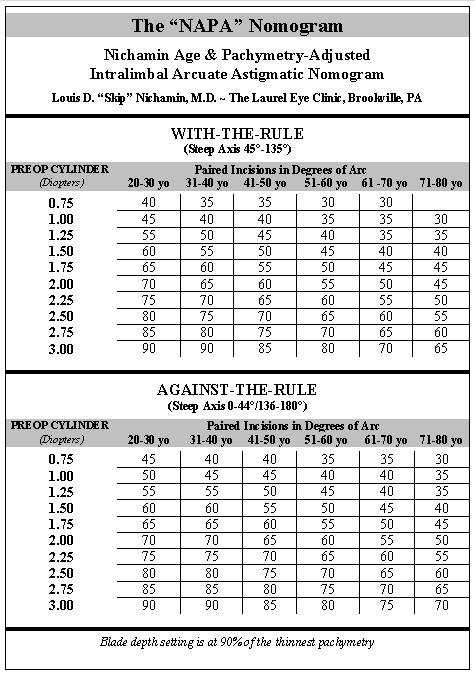 For asymmetrical regular astigmatism, the paired incisions may be different lengths, greater in the axis with the larger amount of cylinder. Alternatively, some surgeons prefer to do the LRI upon completion of the cataract surgery. WaveTec ORange Intraoperative Aberrometer utilizes Talbot-Moire's interferometry, a form of wavefront analysis which has a dynamic range of -20 to +20 D. The device is attached to the surgical microscope. At any point in the surgery, the ophalmologist may take a measurement. The monitor will display the refractive error of the eye. Surgeons who have this technology available in their operating room are able to complete the cataract extraction portion of the procedure. Intraoperative measurements are taken and the appropriate lens and ancillary techniques (LRIs or CRIs/AKs) can be employed. Alternatively, this diagnostic tool may be used to confirm preoperative calculations. Femto Lasers are being incorporated into traditional cataract surgery by an increasing number of ophthalmic surgeons. These machines create laser-assisted capsulorrhexis, side-port and main incisions in addition to nuclear defragmentation. The surgeon can elect to have the laser create the LRIs/AKs at the time of the procedure as well. Precision and uniformity of the location, depth and length of the incisions is likely to increase with this technology. Postoperative follow up should be per routine for cataract surgery when done together. Manifest refractions should be performed. Postoperative corneal topography is also helpful to identify treatment effect. Possible complications of LRI's include infection, overcorrection, undercorrection, perforation of the cornea, induced astigmatism, discomfort and decreased corneal sensation. Overcorrection: Wait for the refraction to stabilize. The incision may be cleaned (with Sinskey hook or similar instrument). Then the wound is sutured with a 10-0 nylon. Placing LRIs perpendicular to the original incisions may induce irregular astigmatism so this method of correction is discouraged. Undercorrections may be corrected by enlarging the original incision. Incisions should be examined carefully at time of placement for corneal perforation. If a perforation is noted, it should be sutured with a 10-0 nylon if it is not self-sealing. This will limit the effect of the procedure. The vast majority of patients do exceedingly well. Even routine cataract surgeries are transitioning into 'refractive' procedures. As patient expectaions for improved refractive outcomes increase, cataract surgeons will find LRIs are a useful and easy to master tool to achieve optimal postoperative results. Boyd K, Edmond JC. Astigmatism. American Academy of Ophthalmology. EyeSmart® Eye health. https://www.aao.org/eye-health/diseases/astigmatism-4. Accessed March 27, 2019. American Academy of Ophthalmology. Refractive Management/Intervention: Limbal relaxing incisions for astigmatism Practicing Ophthalmologists Learning System, 2017 - 2019 San Francisco: American Academy of Ophthalmology, 2017. This page was last modified on March 27, 2019, at 09:53.